The CAP Barbell 20" Two-Tier dumbbell rack will help keep your workout gear organized safely in one place. It is designed to hold a variety of dumbbells including hex cast iron, hex rubber-coated, chrome and Pro-Style. The steel dumbbell rack has an angled lower level for easy lifting. It is made from heavy-gauge steel and has a weight capacity of 500 lbs. 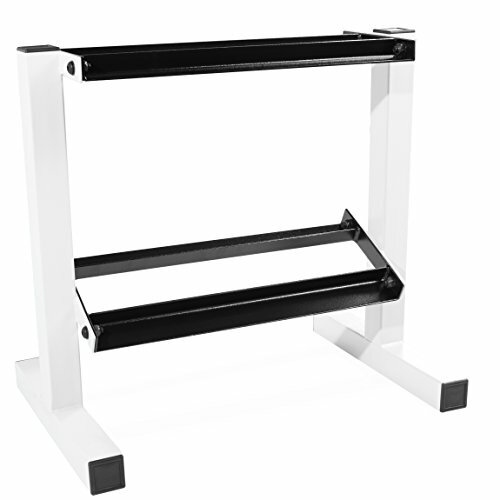 The CAP Barbell rack features a black-and-white finish and will look ideal sitting in your weight room. It includes 20" racks that supply you with plenty of room to store your weights of various sizes. Weights are not included. This setup is ideal for a home gym and a good way to keep your dumbbells up off the floor where they will remain out of harm's way.